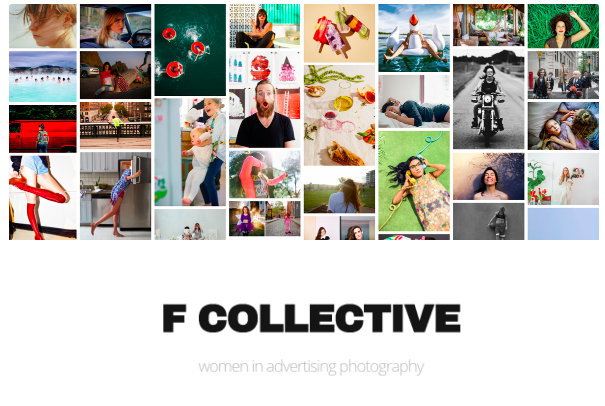 Visura is proud to be a founding sponsor of the F Collective (www.fcollective.org), a database of women photographers in advertising commercial photography. Founded by Diana Mulvihill and Karen Beard—the initiative aims to increase gender diversity in advertising and commercial photography. FACT: 90% of advertising commercial photography is created by men. Inspired by the change created by the Free the Bid initiative to include a female director in each bid for a tv spot, Mulvihill and Beard reached out to Free the Bid to congratulate them and ask if their initiative could include still photographers as well as motion directors. They said that they didn't have the resources to do so, but strongly encouraged them to begin one. Take the pledge + create big change in the world! You are pledging to present the work of at least one woman as an option on each job you present to clients or triple-bid. From there, you recommend to your client the creative that you think is best for the job, woman or man. one bid from a female photographer on every job. All people deserve the opportunity to express themselves + to earn a living. Women are 50% of our population; by taking this pledge, you are valuing what women add to our world + our cultural conversation. Thank you. An initiative that asks brands + their agencies to pledge to present a female photographer option to their client on each job, with a goal of increasing gender diversity in advertising photography.